“ROBOTS ARE NOT taking over the world”, was the message given this week during United Nations talks on the issue of autonomous weapons. That’s according to the diplomat leading the first official talks on the issue, the Convention on Conventional Weapons (CCW), as they sought to ease criticism over slow progress towards restricting the use of so-called “killer robots”. The meeting of the CCW marked an initial step towards an agreed set of rules governing such weapons. The CEO of Tesla and SpaceX joined more than 100 robotics and artificial intelligence entrepreneurs in signing a letter to the UN calling for action to prevent the development of autonomous weapons. “Lethal autonomous weapons threaten to become the third revolution in warfare,” warned the statement signed by 116 tech luminaries, also including Mustafa Suleyman, cofounder of Google’s DeepMind. “Once developed, they will permit armed conflict to be fought at a scale greater than ever, and at timescales faster than humans can comprehend,” the letter reads. “I think we have to be careful in not emotionalising or dramatising this issue,” he told reporters in response to criticism about the speed of the conference’s work. Gill underscored that banning killer robots, or even agreement on rules, remained a distant prospect. “Countries do not have time… to waste just talking about this subject,” Mary Wareham of the arms division at Human Rights Watch told AFP. She said that “militaries around the world and defence companies are sinking a lot of money” into weapons that select and destroy targets without human control. Most nations now agree on the need for a new “legally-binding instrument” controlling the use of killer robots and most “states now accept that some form of human control must be maintained over weapons systems”, a campaign statement said. The question now is deciding “what effective human control means in practice”, the head of the Arms Unit at the International Committee of the Red Cross, Kathleen Lawand, told AFP in an email. The ICRC has not called for a ban, but Lawand warned that action on setting limits was “urgently needed” as the technology was moving fast. The “arms race has happened (and) is happening today” said Toby Walsh, an expert on artificial intelligence at the University of New South Wales in Australia. “These will be weapons of mass destruction”, he added during a side-event at the UN this week. 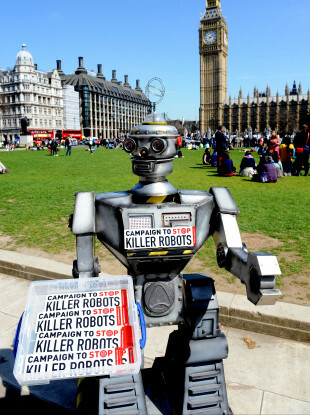 Email “Call for ban on 'killer robots' - but are they really on the way?”. Feedback on “Call for ban on 'killer robots' - but are they really on the way?”.